No, not that kind of gambling. 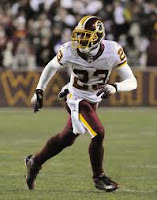 I'm talking about guys like the Redskins' DeAngelo "I’m going wherever the #@$% ball is going” Hall. After blowing a 17-point lead against the Texans early in the season, Hall appointed himself as his own defensive coordinator. He appeared to make good on his promise a few weeks later against the Bears when he reeled in four interceptions, good for a total of 0.99 +WPA. His gambles paid off, and he essentially won the game single-handedly. The Redskins had several players at the top or near the top of the regular season +WPA rankings for defensive positions, Hall being one of them. But as I mentioned when I introduced defensive +WPA for individual defenders, gamblers--guys who roll the dice to make a play rather than adhere to their responsibilities--are most likely to be rewarded disproportionately. The problem is that +WPA doesn't capture all the instances when a gamble goes bad, only the times when it works out. We can't (currently) measure a defender's -WPA, the degree to which a his failures affect game outcomes, because play-by-play descriptions never say things like "DeAngelo Hall bit hard on a double-move, Andre Johnson 67-yard reception for a touchdown." So although we can't attribute defensive failures to individual players, we can measure them on a team level. Locker-room "cancers" really are big problems. Has human athletic performance peaked? Evidenced Based Medicine (EBM) is the idea that for too long doctors have relied on their keen intuition and experience-informed judgment to diagnose illnesses and prescribe treatments. In many ways, the medical professions see themselves as high priests of the art of medicine, a lot like how some football coaches see themselves as shamans of the mystical craft of football. It turns out that study after study finds that diagnoses are often more accurate when the doctors play the percentages, and not the percentages of conventional wisdom, but the real percentages dictated by statistics and probability. Here's a post by a doctor who sees the similarities between what we do here at Advanced NFL Stats and his profession. 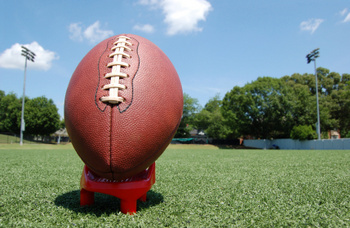 I could really re-title this site Evidenced Based Football. It's really the same idea. Of course, we're not saving lives around here. We're doing something far more important--analyzing grown men crashing into each other while wearing crash helmets and silly costumes. Two of the most notable strategic decisions of 2009 were made by this year's Super Bowl coaches, Mike McCarthy and Mike Tomlin. McCarthy made some bold gambles in the Packers' playoff shootout with the Cardinals. The Packers ultimately lost the game abruptly, but it was McCarthy's tactics that engineered a 21-point comeback to force overtime. Unlike some coaches, he did not throw in the towel. McCarthy called for a surprise onside kick when down by 14 in the third quarter, and he went for multiple 4th down conversions throughout the 2nd half. Don't miss Andrew Foland's 5-part tour de force on how to incorporate pre-game estimates of win probability with the in-game estimates. Awesome job, and I really appreciate the time Andrew has put in. This is something I've been asked to do for a while. I think it's a great idea, and I developed a very similar method to do it. However, I would be reluctant to make it the 'official' WP or WPA model. If the Patriots have a game against a weaker opponent pegged as a 70/30 match-up, and Tom Brady plays lights-out, should he only get 0.30 WPA instead of 0.50 WPA? Should he be penalized for being favored pre-game? Bryan Davies expounds on the go-for-the-2-point-conversion-twice strategy teams should be employing when down by 2 TDs. Jim Glass on the eight stats he hates most. Thanks to everyone who has made the Community Site such a success this season, and to editor Ed Anthony in particular. Keep the posts coming! Here are three graphs I posted recently that plot each team's defensive performance against its offensive performance. Each graph uses a different metric: Success Rate (SR), Expected Points Added (EPA), and Win Probability Added (WPA). Instead of looking at the connection between offensive and defensive performance, look at the shape of the pattern formed by the data. Notice that the width of each plot is bigger than the height. In other words, offenses have wider distributions than defenses in SR, EPA, and WPA. The data set is comprises all 2000 through 2009 regular season teams. One of the reasons I really like the real-time comment/chat feature on the WP graphs is that the analysis is written for me. Thanks, guys. Cutler dug a deep hole in the first half. His accuracy was terrible, or he must have thought that Devin Hester was 8 feet tall the way he kept overthrowing him. Cutler’s interception was especially hurtful because it came on 1st down. First down ints are worse than on later downs because there is no reason to force a ball into coverage. You’ve got three more downs to do that if you need to. If a guy doesn’t have at least half a step, there’s no good reason to try to thread the needle. Cutler finished with a 43% completion rate, good for -0.10 WPA, -6.0 EPA, and only a 25% SR.
Collins was worse. He was 0 for 4 on his attempts, and clearly looked out of depth. Putting Hanie turned out to be the right call. He was 13 for 20 (65%), with a very respectable 45% SR. Unfortunately for the Bears, his two interceptions were extremely costly, and he finished the day with -0.16 WPA and -1.0 EPA. Among the Chicago triple threat of Cutler, Collins, and Hanie, the Bears passing attack totaled -0.29 WPA and -9.9 EPA for the game. Ben Roethlisberger had a rough day passing the ball yesterday, posting just 1.5 Adjusted Yards Per Attempt (AYPA). But he made critical completions when it mattered most, and he made a big difference on his 4 scrambles, converting 3 first downs and a TD. Ultimately, BR put the game away with his final two throws, each for 14 yds and each converting first downs. Those throws were worth 0.06 WPA and 0.08 WPA alone. BR ended up with a 0.29 WPA for the game, 5.0 EPA, and a 51.6% SR. 5.0 EPA doesn’t exactly scream MVP, but then again, when the final whistle blew, PIT won by exactly 5 points. 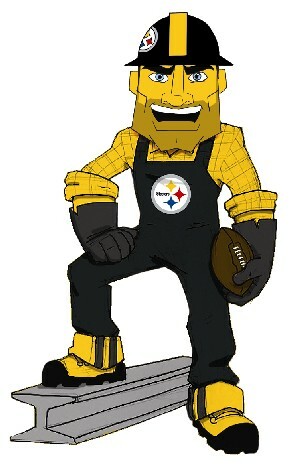 One big reason for the win was the Steelers’ rushing attack. Rashard Mendenhall ran at a 4.5 YPC pace, accumulating 0.13 WPA, and 3.9 EPA. A better job of tackling would have really changed the complexion of the game, as Rex Ryan lamented in his postgame press conference. Removing BR’s scrambles, the Steelers only had a 42% SR on their running plays, which is right at league-average. Contrary to conventional wisdom, PIT is not a great running team, but the Jets allowed Mendenhall to gain too many yards after getting through the first level of defenders. Wikipedia is awesome. There's an entry for Win Probability, which is cool. But it's got a tag that it may not meet 'notability' guidelines, and it may be removed soon. But there's also a Win Probability Added page, and it makes sense to me that they should be merged. There's an entry for Advanced NFL Stats, but it's a little dated. I confess I created it, but it doesn't seem proper that I taut my hobby on my own. Search engines ignore links from Wikipedia (to prevent people from gaming it), so I derive no real benefit from the entries. I do think it is a service to people who are genuinely interested in learning more about sports research. That's where you guys can help out. You can contribute to the community by updating the Wikipedia entries, keeping them relevant and useful to readers. 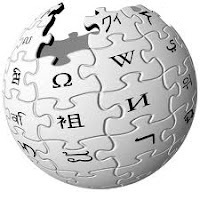 Updating the references and external links would be helpful, and adding "see also" links to other Wikipedia pages is especially handy for people wanting to learn more. For example, you could add, "2009 was the year that Carson Cistulli began ruining what was once a good site." Oh, and by the way, I was just kidding in the line above about Carson. It was actually 2010. Rather, it's this: owing to some mid-week site changes, each post here at Advanced NFL Stats (ANS) now has, appended to it, the name of said post's author. The sympathetic reader will understand immediately how such a thing might threaten the serenity of Carson Cistulli's inner soul: for 19 or so weeks, I've been able to submit my weekly dispatches more or less under the cloak of anonymity*. Or better than anonymity, really: for it's wholly possible that, having no explicit knowledge regarding the authorship of my posts, that readers have mistakenly assumed that they (i.e. the posts) have been written not by the very ridiculous and mostly uninformed Carson Cistulli, but, instead, by the very competent and all-knowing Brian Burke. *A totally expensive type of cloak designed by British fashion house Burberry. In other words, it's likely that I've benefited from this authorly ambiguity (even, perhaps, as Brian's reputation has has been tarnished considerably). How good has Aaron Rodgers been in his 3 playoff starts? Before we get too excited about Rodgers' place among the game's greats, keep in mind just how much friendlier the league has become to passers over the years. Even over a one year span, 2010 was measurably easier to throw in than 2009. Are playoff byes worthless, or even bad? (Helmet-knock: Tango) Tango nails it. We're looking at too small a sample to tell anything, and what we do see is not far off from what we'd expect. Keep in mind that in the regular season since 1994 (a fairly big sample) teams coming off byes win 53% of the time. Also, keep in mind that a bye is essentially an automatic playoff win! It nearly doubles a team's chances of making it to the Super Bowl over any other team without a bye. Are NFL coaches finally catching on to advanced stats? Yes, they are. I know first hand that multiple teams use advanced analysis. Kovash, who is now with the Cowboys, is a smart guy and Jason Garrett would do well to listen to him. Football Outsiders' Starter-Games-Lost stat for 2010. The Secret to the Falcons' Success? The Wall Street Journal's Michael Saffino wrote an article last week about the Falcons' aggressive tendencies on fourth down this season. In opponent territory, with 3 yards or less to go and more than 4 minutes remaining, the Falcons went for the conversion on 72% of their opportunities, the most in the league. They converted on 85% of those attempts. The review of the game's play-by-play indicated that Atlanta would have scored 21 points according to league-average field goal rates, but following their successful conversions the Falcons actually went on to score 51 points--a net of 30 additional points. 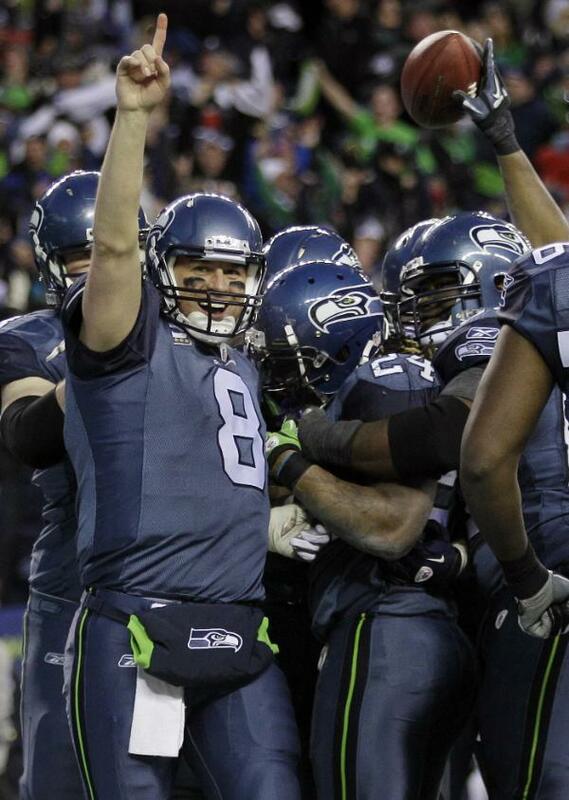 And in 3 games, the points scored off of 4th down conversions made the difference in the win. 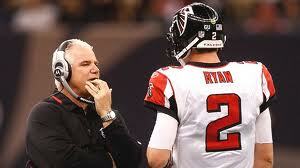 Could this be the explanation for the Falcons' dramatic over-performance this season? In this post, I'll attempt a few things. First, I'll discuss how we should properly measure the impact of 4th down decisions and measure the wisdom of the decisions themselves. Then I'll look specifically at the Falcons' 4th down situations and measure their impact on Atlanta's fortunes in terms of EPA and WPA. Lastly, I'll look at how all the teams did in terms of 4th down decisions. Weekly game probabilities are available now at the nytimes.com Fifth Down. This week I take a look at how the numbers suggest the Jets should attack the Steelers. In a recent post about team balance, I noted that we should expect a correlation between a team's offensive performance and its defensive performance--at least, not in the same way we would expect to see a team's passing and running performance correlate. Jared commented that although we shouldn't expect a positive correlation, perhaps we should expect a negative one. A negative correlation between team offense and defense would mean that the better the offense, the worse the defense, and vice-versa. This would make sense in the salary cap era because the more resources a team invests on one side of the ball, the fewer resources it can invest on the other side. If you are throwing $15 million/yr at a star QB, that's $15 million less available to shore up a weak secondary. And that star left tackle drafted in the first round is a top defensive end that's going to some other team. On the other hand, it could be that good GMs and well-run organizations would simultaneously produce teams composed of both above-average offenses and defenses. Conversely, dysfunctional organizations would produce poor squads on both sides of the ball. The new killer stat according to ESPN's Peter Keating. The current issue is on sale now, but Insider subscribers can read it online. Peter is ESPN's writer covering sports analytics. He interviewed me for the article, and he clearly understands how useful WP can be. It's not just for measuring the impact or predicting a game's outcome while in progress. It's about strategic decisions. Don't be surprised as this stuff gradually becomes more mainstream. This was a game of big plays, or more accurately, a game of big mistakes and missed opportunities. It was a tale of two halves. BAL took the first half, and PIT took the second half. The biggest play of the game was the 58-yard pass to Antonio Brown to the BAL 4-yd line on a 3rd and 19 play, which was worth 0.46 WPA for the Steelers. Until that pass, BAL, despite its comedy of self-inflicted wounds, still had a 0.60 WP. With a stop there, they would have had 2 minutes to put together a FG drive to break the tie. Earlier in that same drive, Hines Ward caught a 12-yd pass on 3rd and 10, worth 0.22 WPA, which was the second biggest play of the night for PIT. A stop there would have given BAL a firm upper hand as well. One of the boldest decisions of the playoffs so far had to be the 4th down QB sneak by Roethlisberger early in the 4th quarter. 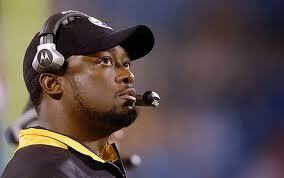 With the score tied at 21, on 4th and less than a yard at the BAL 14, Tomlin passed up the near-sure thing go-ahead FG. For that decision to make sense, the break-even conversion probability would need to be at least 50%. Fortes fortuna adiuvat. This week's edition of The Weekly League isn't an edition of The Weekly League at all. • Until that point, he'd pitched with the same team (the Atlanta Braves) for his entire 21-year career. • He was (is) a future Hall of Famer. • He was coming off major surgery to a torn labrum in his pitching shoulder. • He would likely not be available to pitch until June. • He was old (41). The move was generally considered a good one for the Sox, who paid Smoltz a base salary of about $5.5 million, with incentives that could net the pitcher something in the vicinity of $10 million. And the deal looked even smarter after Smoltz made his first minor-league start in May, pitched well through his entire rehab stint, and made his Red Sox debut on June 25th at Washington. Yet, besides the fact that he was able to make it at all, that start against the Nationals didn't go so great. Smoltz allowed seven hits and five earned runs in five innings, taking the loss. And, actually, that performance was typical of his eight-start tenure with the Sox. Before being released by the team on August 17th, Smoltz' line with the Sox looked like this: 40.0 IP, 59 H, 37 ER, 8.33 ERA. 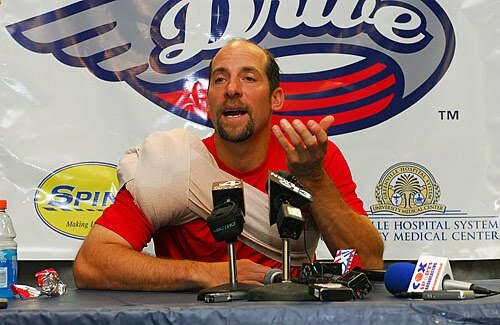 By the majority of fans and local media, the Smoltz Experiment was considered a failure. It's no wonder the odds-makers put the Steelers as 3-point favorites over the Ravens, the exact amount of points traditionally given to home teams. They appear to be identical teams in so many ways. We can see why in the graph below. Like I did recently with running and passing Success Rate (SR) charts, I've plotted each team's total offense and total defense. This time I used opponent-adjusted SR, which accounts for the SRs of each team's opponents. Unlike passing and running SR, which correlate to a fair degree, there is no reason to expect team offense and team defense to correlate. We shouldn't expect to see a nice tight diagonal relationship like we did when looking at passing and running. But we can still see team balance. Seeing what we expect to see. The Saints avoided kicking to Seattle's Leon Washington. How much did it cost them? Final QB ratings from Wages of Wins, plus some thoughts on the Lions. 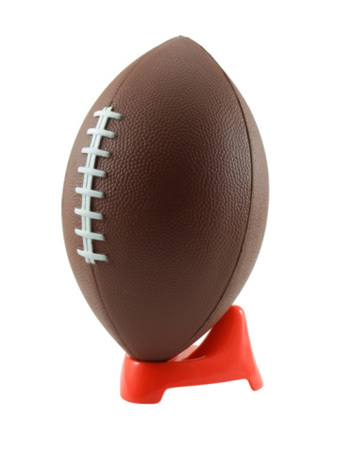 Playoff games, and many teams' entire seasons, come down to their kickers. Here's how the remaining team's PKs stack up. All four games this weekend are rematches. What do prior games between opponents tell us about playoff outcomes? It might be a little late in the season for stuff like this, but better late than never. Often we can learn a lot by taking information we already have and graphing it. In this case, I've taken each team's Success Rate (SR) stats for running and passing and plotted them against each other. As you might recall from a post early in the season, SR is one stat where passing and running actually correlate, suggesting that "success" is the component of performance that coaches try to optimize. Simply put, from the perspective of game theory, it's how we can tell that running "sets up the pass" and vice versa. SR for both running and passing is also a reliable predictor of team success, i.e. winning. If we plot each team's pass SR by its run SR for 2010, we should expect to see a correlation, represented by a diagonal trend. The better teams will be on the top and right, while the worse teams will be on the bottom left. Also, we would not expect to see many teams that are very good in one aspect, either running or passing, but not any good in the other. Weekly game probabilities are available now at the nytimes.com Fifth Down. This week I conduct a little experiment about our perceptions of team strength and reality. Everyone is going to remember the incredible Marshawn Lynch TD run, but the play that tilted the game outcome most was thanks to the Seahawks defense. With 9:59 to play, down by a TD, NO threw the ball on 3rd and goal from the 3. The SEA defense stopped Devery Henderson on the 1-yard line, forcing a NO FG. That play dropped the Saints' WP from 0.36 to 0.23, the biggest swing of the 4th quarter. It seems to be the biggest reasons for the upset were some inventive plays run by SEA. The fake block, fall down, spit out left wide open for the TD play by John Carlson was clever. But more importantly, all game long the SEA offense invited the NO defense to jump short routes then double-move deep. The NO defense gambled and lost. They were heavy favorites and should have been doing everything except gambling. Low variance is the friend of the favorite. This week's edition of The Weekly League features more links than all my gold chains combined. • Neither of these teams, you'll notice, "should" have a winning percentage above .500. 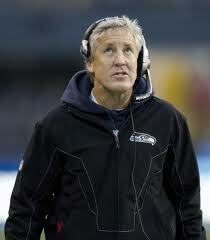 • The Seahawks, in fact, "should" have the fourth-worst record in the entire NFL. • Question: Does this -- that is, the fact that Seattle's in the playoffs and even playing at home -- does this delegitimize the current NFL playoff structure? • Reason: Sport is defined by constraints (i.e. rules) agreed upon by the majority of participants. Occasionally, those constraints produce peculiar outcomes, but they're never objectively bad outcomes. The violence of football put in historical perspective. This is from a Peter King MMQB that's a couple weeks old, but I liked the detailed narrative of what goes into a punt from Vikings punter Chris Kluwe. I just really enjoy it when I read something from a player who can articulate what goes into their craft. Not all official gamebooks are created equal. Some scorers add extra details. The crew at Dallas is especially good. Here is one from Buffalo that adds details of the depth and location of each pass attempt. Helmet-knock: Adam Tarr. 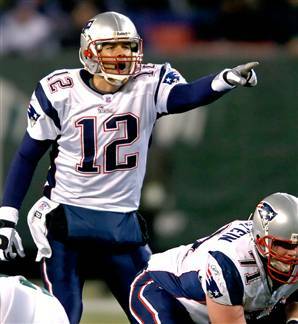 Can you guess the top selling NFL jersey? I guessed Tebow. Help Chase out by comparing Matt Ryan and Jake Long. I've got an article in Slate today that takes a look at how the new overtime rules might affect the likelihood of onside kicks. My thanks to Josh Levin who had the idea for the article and who jazzed up the prose quite a bit. Longtime reader Adam Tarr (perhaps longest?) examines which QBs are picking up the most yardage from their receivers. Don't miss the comment thread. Which teams carry their QBs, and which QBs carry their teams? Jim Glass tells us. I the holiday spirit, Community site editor Ed Anthony takes a look at whether it's better to give or receive. The results are surprising. Really. That's not a tease. Denis O'Regan adjusts QB interception rates for depth of throws. 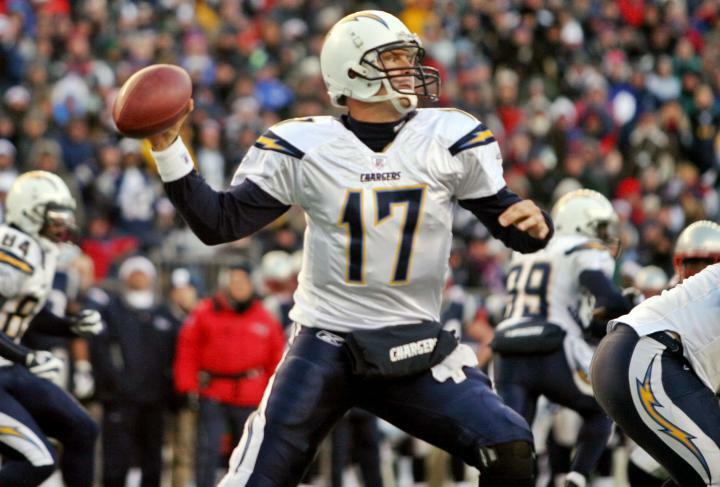 Steven Buzzard, who might rank near Mr. Tarr in terms of seniority around Advanced NFL Stats, takes a look at which playoff teams were 'clutch' and which were 'chokers'. Play-by-play data for the 2010 regular season is now available to download. Previous seasons going back to 2002 are also available. I had intended to update the data more frequently this season, but it can be fairly time consuming. Many thanks to John Candido who posted several updates on his own at the Community site. Weekly game probabilities are available now at the nytimes.com Fifth Down. This week I focus on the one game where the model differs from the consensus favorite. The match-up pages have been updated to include drop down menus to create a match-up page for any two teams. The division games, championship games, and the Super Bowl still await their opponents, so you can choose any two teams to see how they stack up against each other in terms of efficiency stats and advanced metrics like WPA, EPA or SR. You can also peek at who the top players are each position for each hypothetical opponent. Just click on one of the upcoming games in the scoreboard bar or go directly the match-up page. 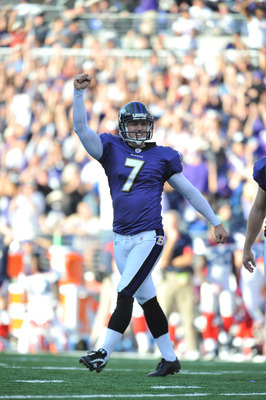 Last Sunday Baltimore's kicker Billy Cundiff tied the NFL regular season record for the most touchbacks with 40. That's over a 50% touchback rate. How big of an advantage did this give the Ravens? Well, the title says it all. I could also say he would be as valuable as the 7th best running back in the league. This past year was a big one for this site. For the first time Advanced NFL Stats became a full-featured destination for advanced football analysis. There was always the blog, then came the win probability graphs, and this year marked a major leap forward with advanced statistics for players and teams, plus new features like the match-up pages and live comments during games. I get the feeling some readers think I run this site full time, but it's really just a small hobby. (Ok, really big hobby.) I truly do it for fun and for the satisfaction I get from learning new things. In addition to running the site, 2010 was a busy year for me. I got married, bought a new house, moved (twice), and worked full time which included travel out of the country for almost a quarter of the football season. (Bet you couldn't even tell I was gone). I also trained for and completed my second triathlon. Last year I did a fun post that highlighted all the best articles and features of 2009, and this post will do the same thing for 2010. There are lots of new readers, and I realize it's difficult to comb through the archives looking for interesting nuggets, so this will hopefully collect them all in one place. I'll start with last January and go in chronological order. Keep in mind this is only a fraction of the 243 posts of 2010.